This article is about loose or woven carbon filament. For the rigid composite material made from carbon fiber used in aerospace and other applications, see Carbon fiber reinforced polymer. Carbon fibers or carbon fibres (alternatively CF, graphite fiber or graphite fibre) are fibers about 5–10 micrometres in diameter and composed mostly of carbon atoms. Carbon fibers have several advantages including high stiffness, high tensile strength, low weight, high chemical resistance, high temperature tolerance and low thermal expansion. These properties have made carbon fiber very popular in aerospace, civil engineering, military, and motorsports, along with other competition sports. However, they are relatively expensive when compared with similar fibers, such as glass fibers or plastic fibers. To produce a carbon fiber, the carbon atoms are bonded together in crystals that are more or less aligned parallel to the long axis of the fiber as the crystal alignment gives the fiber high strength-to-volume ratio (making it strong for its size). Several thousand carbon fibers are bundled together to form a tow, which may be used by itself or woven into a fabric. Carbon fibers are usually combined with other materials to form a composite. When impregnated with a plastic resin and baked it forms carbon-fiber-reinforced polymer (often referred to as carbon fiber) which has a very high strength-to-weight ratio, and is extremely rigid although somewhat brittle. 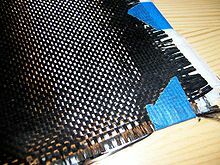 Carbon fibers are also composited with other materials, such as graphite, to form reinforced carbon-carbon composites, which have a very high heat tolerance. In 1860, Joseph Swan produced carbon fibers for the first time, for use in light bulbs. In 1879, Thomas Edison baked cotton threads or bamboo slivers at high temperatures carbonizing them into an all-carbon fiber filament used in one of the first incandescent light bulbs to be heated by electricity. In 1880, Lewis Latimer developed a reliable carbon wire filament for the incandescent light bulb, heated by electricity. In 1958, Roger Bacon created high-performance carbon fibers at the Union Carbide Parma Technical Center located outside of Cleveland, Ohio. Those fibers were manufactured by heating strands of rayon until they carbonized. This process proved to be inefficient, as the resulting fibers contained only about 20% carbon and had low strength and stiffness properties. In the early 1960s, a process was developed by Dr. Akio Shindo at Agency of Industrial Science and Technology of Japan, using polyacrylonitrile (PAN) as a raw material. This had produced a carbon fiber that contained about 55% carbon. In 1960 Richard Millington of H.I. Thompson Fiberglas Co. developed a process (US Patent No. 3,294,489) for producing a high carbon content (99%) fiber using rayon as a precursor. These carbon fibers had sufficient strength (modulus of elasticity and tensile strength) to be used as a reinforcement for composites having high strength to weight properties and for high temperature resistant applications. The high potential strength of carbon fiber was realized in 1963 in a process developed by W. Watt, L. N. Phillips, and W. Johnson at the Royal Aircraft Establishment at Farnborough, Hampshire. The process was patented by the UK Ministry of Defence, then licensed by the British National Research Development Corporation to three companies: Rolls-Royce, who were already making carbon fiber; Morganite; and Courtaulds. Within a few years, after successful use in 1968 of a Hyfil carbon-fiber fan assembly in the Rolls-Royce Conway jet engines of the Vickers VC10, Rolls-Royce took advantage of the new material's properties to break into the American market with its RB-211 aero-engine with carbon-fiber compressor blades. Unfortunately, the blades proved vulnerable to damage from bird impact. This problem and others caused Rolls-Royce such setbacks that the company was nationalized in 1971. The carbon-fiber production plant was sold off to form Bristol Composites. In the late 1960s, the Japanese took the lead in manufacturing PAN-based carbon fibers. A 1970 joint technology agreement allowed Union Carbide to manufacture the Japan’s Toray Industries product. Morganite decided that carbon-fiber production was peripheral to its core business, leaving Courtaulds as the only big UK manufacturer. Courtelle's water-based inorganic process made the product susceptible to impurities that did not affect the organic process used by other carbon-fiber manufacturers, leading Courtaulds ceasing carbon-fiber production in 1991. During the 1960s, experimental work to find alternative raw materials led to the introduction of carbon fibers made from a petroleum pitch derived from oil processing. These fibers contained about 85% carbon and had excellent flexural strength. Also, during this period, the Japanese Government heavily supported carbon fiber development at home and several Japanese companies such as Toray, Nippon Carbon, Toho Rayon and Mitsubishi started their own development and production. Since the late 1970s, further types of carbon fiber yarn entered the global market, offering higher tensile strength and higher elastic modulus. For example, T400 from Toray with a tensile strength of 4,000 MPa and M40, a modulus of 400 GPa. Intermediate carbon fibers, such as IM 600 from Toho Rayon with up to 6,000 MPa were developed. Carbon fibers from Toray, Celanese and Akzo found their way to aerospace application from secondary to primary parts first in military and later in civil aircraft as in McDonnell Douglas, Boeing, Airbus, and United Aircraft Corporation planes. Carbon fiber is frequently supplied in the form of a continuous tow wound onto a reel. The tow is a bundle of thousands of continuous individual carbon filaments held together and protected by an organic coating, or size, such as polyethylene oxide (PEO) or polyvinyl alcohol (PVA). The tow can be conveniently unwound from the reel for use. Each carbon filament in the tow is a continuous cylinder with a diameter of 5–10 micrometers and consists almost exclusively of carbon. The earliest generation (e.g. T300, HTA and AS4) had diameters of 16–22 micrometers. Later fibers (e.g. IM6 or IM600) have diameters that are approximately 5 micrometers. The atomic structure of carbon fiber is similar to that of graphite, consisting of sheets of carbon atoms arranged in a regular hexagonal pattern (graphene sheets), the difference being in the way these sheets interlock. Graphite is a crystalline material in which the sheets are stacked parallel to one another in regular fashion. The intermolecular forces between the sheets are relatively weak Van der Waals forces, giving graphite its soft and brittle characteristics. Depending upon the precursor to make the fiber, carbon fiber may be turbostratic or graphitic, or have a hybrid structure with both graphitic and turbostratic parts present. In turbostratic carbon fiber the sheets of carbon atoms are haphazardly folded, or crumpled, together. Carbon fibers derived from polyacrylonitrile (PAN) are turbostratic, whereas carbon fibers derived from mesophase pitch are graphitic after heat treatment at temperatures exceeding 2200 °C. Turbostratic carbon fibers tend to have high tensile strength, whereas heat-treated mesophase-pitch-derived carbon fibers have high Young's modulus (i.e., high stiffness or resistance to extension under load) and high thermal conductivity. In 2012, estimated global demand for carbon fiber market was $1.7 billion with estimated annual growth of 10–12% from 2012–2018. The strongest demand for carbon fiber come from aircraft and aerospace, wind energy, as well as the automotive industry with optimized resin systems. Carbon fiber can have higher cost than other materials which has been one of the limiting factors of adoption. In a comparison between steel and carbon fiber materials for automotive materials, carbon fiber cost may be 10-12x more expensive. However, this cost premium has gone down over the past decade from estimates of 35x more expensive than steel in the early 2000s. Carbon fiber is most notably used to reinforce composite materials, particularly the class of materials known as carbon fiber or graphite reinforced polymers. Non-polymer materials can also be used as the matrix for carbon fibers. Due to the formation of metal carbides and corrosion considerations, carbon has seen limited success in metal matrix composite applications. Reinforced carbon-carbon (RCC) consists of carbon fiber-reinforced graphite, and is used structurally in high-temperature applications. The fiber also finds use in filtration of high-temperature gases, as an electrode with high surface area and impeccable corrosion resistance, and as an anti-static component. Molding a thin layer of carbon fibers significantly improves fire resistance of polymers or thermoset composites because a dense, compact layer of carbon fibers efficiently reflects heat. The increasing use of carbon fiber composites is displacing aluminum from aerospace applications in favor of other metals because of galvanic corrosion issues. Precursors for carbon fibers are polyacrylonitrile (PAN), rayon and pitch. Carbon fiber filament yarns are used in several processing techniques: the direct uses are for prepregging, filament winding, pultrusion, weaving, braiding, etc. Carbon fiber yarn is rated by the linear density (weight per unit length; i.e., 1 g/1000 m = 1 tex) or by number of filaments per yarn count, in thousands. For example, 200 tex for 3,000 filaments of carbon fiber is three times as strong as 1,000 carbon filament yarn, but is also three times as heavy. This thread can then be used to weave a carbon fiber filament fabric or cloth. The appearance of this fabric generally depends on the linear density of the yarn and the weave chosen. Some commonly used types of weave are twill, satin and plain. Carbon filament yarns can also be knitted or braided. Known for their conductivity, carbon fibers can carry very low currents on their own. When woven into larger fabrics, they can be used to reliably deliver infrared heating in applications requiring flexible heating elements and can easily sustain temperatures past 100 °C due to their physical properties. Many examples of this type of application can be seen in 'DIY' or Do it Yourself heated articles of clothing and blankets. Due to its chemical inertness, it can be used relatively safely amongst most fabrics and materials; however, shorts caused by the material folding back on itself will lead to increased heat production and can lead to fire. High temperature oxidative treatment of carbonization (hydrogen is removed). After this, process of graphitization starts where nitrogen is removed and chains are joined into graphite planes. Each carbon filament is produced from a polymer such as polyacrylonitrile (PAN), rayon, or petroleum pitch, known as a precursor. For synthetic polymers such as PAN or rayon, the precursor is first spun into filament yarns, using chemical and mechanical processes to initially align the polymer molecules in a way to enhance the final physical properties of the completed carbon fiber. Precursor compositions and mechanical processes used during spinning filament yarns may vary among manufacturers. After drawing or spinning, the polymer filament yarns are then heated to drive off non-carbon atoms (carbonization), producing the final carbon fiber. The carbon fibers filament yarns may be further treated to improve handling qualities, then wound on to bobbins. A common method of manufacture involves heating the spun PAN filaments to approximately 300 °C in air, which breaks many of the hydrogen bonds and oxidizes the material. The oxidized PAN is then placed into a furnace having an inert atmosphere of a gas such as argon, and heated to approximately 2000 °C, which induces graphitization of the material, changing the molecular bond structure. When heated in the correct conditions, these chains bond side-to-side (ladder polymers), forming narrow graphene sheets which eventually merge to form a single, columnar filament. The result is usually 93–95% carbon. Lower-quality fiber can be manufactured using pitch or rayon as the precursor instead of PAN. The carbon can become further enhanced, as high modulus, or high strength carbon, by heat treatment processes. Carbon heated in the range of 1500–2000 °C (carbonization) exhibits the highest tensile strength (5,650 MPa, or 820,000 psi), while carbon fiber heated from 2500 to 3000 °C (graphitizing) exhibits a higher modulus of elasticity (531 GPa, or 77,000,000 psi). Currently, a number of research institutions are carrying out research to try to synthesise carbon fiber from renewable, non-petroleum based feedstocks. If successful, this could reduce greenhouse gas emissions associated with carbon fiber manufacture as well as long term costs of production. ^ Deng, Yuliang (2007). Carbon Fiber Electronic Interconnects (PDF) (Thesis). Archived (PDF) from the original on 2019-04-04. Retrieved 2017-03-02. ^ "High Performance Carbon Fibers". National Historic Chemical Landmarks. American Chemical Society. 2003. Archived from the original on 2014-04-27. Retrieved 2014-04-26. ^ "The Gifted Men Who Worked for Edison". National Park Service. Archived from the original on 2015-02-07. Retrieved 2014-12-01. ^ "Stand Points". Flight International: 481. 1968-09-26. Archived from the original on 2014-08-14. Retrieved 2014-08-14 – via Flight Global Archive. ^ a b Cantwell, W.J. ; Morton, J. (1991). "The impact resistance of composite materials – a review". Composites. 22 (5): 347–362. doi:10.1016/0010-4361(91)90549-V.
^ Das, Sujit; Warren, Josh; West, Devin (May 2016). "Global Carbon Fiber Composites Supply Chain Competitiveness Analysis" (PDF). Clean Energy Manufacturing Analysis Center. Archived (PDF) from the original on 2017-03-29. Retrieved 2017-05-24. ^ "Market Report: World Carbon Fiber Composite Market". Acmite Market Intelligence. May 2016. Archived from the original on 2011-09-02. ^ Hillermeier, Roman W.; Hasson, Tareq; Friedrich, Lars; Ball, Cedric (2013). "Advanced Thermosetting Resin Matrix Technology for Next Generation High Volume Manufacture of Automotive Composite Structures" (PDF). SAE Technical Paper. doi:10.4271/2013-01-1176. Archived from the original (PDF) on 2015-09-21. ^ Bregar, Bill (5 August 2014). "Price keeping carbon fiber from mass adoption - Plastics News". Plastics News. Atlanta: Crain Communications, Inc. Archived from the original on 2016-12-09. Retrieved 2017-05-25. ^ Banis, David; Marceau, J. Arthur; Mohaghegh, Michael (July 1999). "Design for Corrosion". Aero. No. 7. Boeing. Archived from the original on 2013-09-02. Retrieved 2018-05-07. ^ Warwick, Graham; Norris, Guy (2013-05-06). "Metallics Make Comeback With Manufacturing Advances". Aviation Week & Space Technology. Archived from the original on 2015-04-27. ^ Pike, Carolyn M.; Grabner, Chad P.; Harkins, Amy B. (2009-05-04). "Fabrication of Amperometric Electrodes". Journal of Visualized Experiments (27). doi:10.3791/1040. PMC 2762914. ^ "How is Carbon Fiber Made?". Zoltek. Archived from the original on 2015-03-19. ^ "Bio-based carbon fibre from wood within ten years". Innventia. 2014-06-04. Archived from the original on 2015-04-02. ^ "Energy Department Announces $11 Million to Advance Renewable Carbon Fiber Production from Biomass". U.S. Department of Energy. 2014-07-30. Archived from the original on 2015-02-07. ^ Barrett, Axel (2014-02-17). "Carbon Fiber from Biomass". Bioplastics News. Archived from the original on 2015-01-28. Wikimedia Commons has media related to Carbon fibres. This page was last edited on 14 April 2019, at 22:58 (UTC).